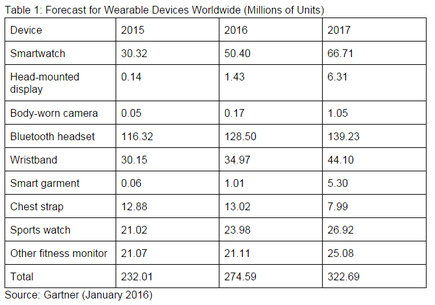 The researcher is predicting an increase of 18.4 per cent in the wearables market from 232 million units in 2015. According to the forecast, sales of wearable electronic devices will generate revenue of $US28.7 billion in 2016. Of that, $11.5 billion will be from smartwatches, it said. Gartner research director, Angela McIntyre, said from 2015 through 2017, smartwatch adoption will have 48 per cent growth largely due to Apple popularising wearables as a lifestyle trend. “Smartwatches have the greatest revenue potential among all wearables through 2019, reaching $US17.5 billion," she added. "Though the sales of smartwatches are the one of the strongest types of wearables, their adoption will remain much below sales of smartphones. For example, in 2016 more than 374 million smartphones will sell in mature market countries and in large urban areas of emerging market countries, for example, in Hong Kong and Singapore." In addition, fitness wearables will continue to increase in popularity, with Gartner saying this will be driven, in part, by US-based wellness programs. "Of all the fitness wearables, sports watches will be the one product category to maintain its average retail price over the next several years," McIntyre said. "Race runners, cyclists and divers will choose sports watches over smartwatches because the user interface, capabilities and durability are tailored to the needs of an athlete in their sport. Continued advances in sensors and analytics for sports watches will bring new capabilities that bolster average retail prices." Although the size of the worldwide wristband market was on par with the unit sales of smartwatches in 2015, the firm said smartwatches will have stronger appeal with consumers as they typically have more multifunctional devices that can track exercise. 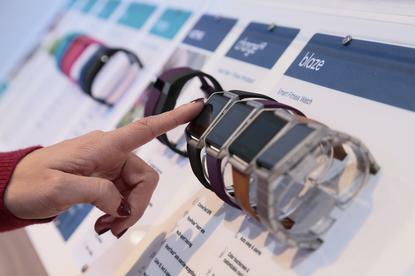 Gartner went on to say wristband providers are experimenting with how to compete with smartwatches and take market share from the market leader, Fitbit.